Council Meeting characterised by disruptions, delays and tense exchanges lasted late into the night - and at the end of it, the motion of no confidence brought against Nelson Mandela Bay Municipality Executive Mayor, Mongameli Bobani, was thrown out. Drama characterised the Nelson Mandela Bay Municipality's Council Meeting on Thursday, which extended late into the night following a series of disruptions by Councillors. At the end of it, the motion of no confidence brought against Nelson Mandela Bay Municipality Executive Mayor, Mongameli Bobani, by the Patriotic Alliance's (PA), Marlon Daniels, and supported by the African Christian Democratic Party's (ACDP) Lance Grootboom, was summarily thrown out. Thursday's Council Meeting is easily among the longest that councillors and the gathered media had to endure. For starters, the start of the Council Meeting was delayed after Councillors and the public gallery were asked to wait outside the Woolboard Exchange, where the Council Meeting was taking place, after the venue went dark due to an electricity fault. 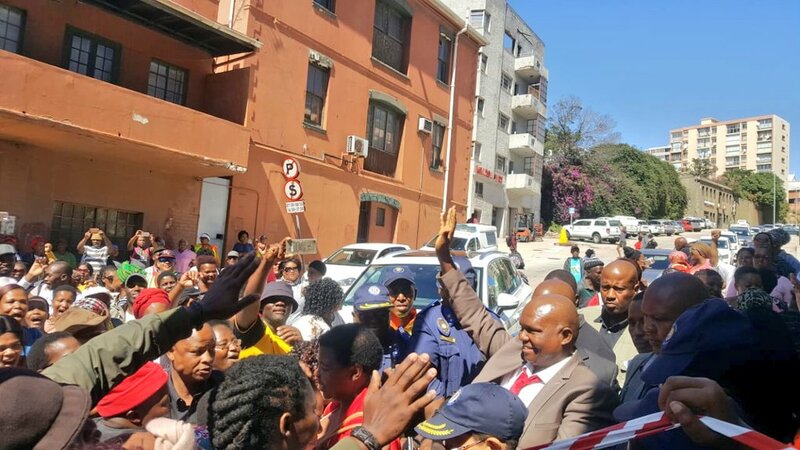 When that was sorted, chaos and exchanges broke out among Councillors when opposition parties objected to the presence of African National Congress (ANC) Councillor, Bongo Nombiba, in the Council Chambers. Nombiba, who was convicted of corruption and jailed last year, shocked everyone when he pitched up for the Council Meeting. This is after his petition to the Supreme Court of Appeals to appeal both his conviction and sentence failed - which the opposition argued means he should be sent back to prison. Grootboom said: "I think what is very important here is that the court has ruled and dismissed the application of Councillor of Nombiba." "We are sitting here with an illegal Councillor." The Council Meeting had to be adjourned to allow for the Nelson Mandela Bay Municipality's lawyers to provide a legal opinion on Nombiba's status. When the meeting resumed, Nelson Mandela Bay Municipality Speaker Buyelwa Mafaya said that Acting Nelson Mandela Bay Municipality City Manager, Peter Nielson, had received legal advice that Nombiba still has until 12 March to appeal the SCA's decision - so he cannot be sent back to prison yet. The lawyers, McWilliams & Elliott Inc Arttoneys, stated that until that date, Nombiba could still seat in the Chamber as a qualifying councillor. However, that did not end the bickering between Councillors. There were further delays as parties asked for time to caucus. The Council Meeting's agenda was only opened after 14:00 due to the delays. Outside, Mongameli Bobani's supporters came in their numbers to support the Mayor. However, after the Nombiba issue was resolved the DA argued that its rogue Councillor, Victor Manyathi, who last year aided in the ousting of the then DA-led coalition government, was not sitting with the DA, but with the ANC, which caused more drama and arguments in the Council Chambers. As chairs were exchanged for Manyathi to sit, a war of words broke out between DA and ANC councillors. Meanwhile the Economic Freedom Fighters' (EFF) Zilindile Vena kept shouting; "We are not safe here, we are not safe here - people are angry. Councilor Manyathi should be allowed to vote with his conscious there is no such thing as not voting." It was only later that Council managed to proceed with the business of the day. The highlight of the day, motion of no confidence brought against Bobani was the last item on the agenda. This was the second motion of confidence brought against the Mayor since he took office in August last year. A motion brought against him by the DA last year fell flat. Finally, at around 00:00, the motion of no confidence against Bobani was tabled and thrown out of the window right there and then.